According to Michigan death records, Charles A. Millard was born in Connecticut about 1834, and died in Detroit on January 25, 1890 or 1891. There are several entries for the 1890 date, and one entry showing 1891. C. A. Millard was a prominent photographer in Detroit. Page 125 of the 1880 city directory for Detroit shows an advertisement taking up one third of the page for Powelson & Millard, (Successors to B. F. Powelson,) Artistic Photographers. Address 224 and 226 Woodward Ave., Detroit. A price breakdown showing as: Photos in cards from $2.00 – $3.00 per dozen. Cabinets from $5.00 – $8.00 per dozen. Panels from $5.00 – $10.00 per dozen. Life-size portraits in Crayon, India Ink, Oil and Water Colors from $25.00 – $100.00. Negatives preserved. There is an excellent book by John William Leonard with the amazingly long title of: The Industries of Detroit: Historical, Descriptive and Statistical. Her Relations as a Centre of Trade, Manufacturing Establishments and Business Houses. (This book contains some wonderful illustrations for early Detroit buildings, the waterfront, etc.) The author’s preface is dated October 1887. Quoting Leonard, “Mr. Millard is engaged in all kinds of first-class photographic work, making specialties of life-size portraits in crayon, India ink, pastelles, oil and water colors: and commercial work in photographs, albertypes, and photo-lithographs. The excellence attained by him of all departments of his business has secured for his studio a patronage not only from the residents of Detroit, but also from visitors from all parts of the Union and Canada.” Leonard describes the studio as “one of the most elegantly appointed in the country” and the size of the employed workforce as between ten and fifteen “highly skilled artists.” C. A. Millard teamed up with Benjamin F. Powelson and later bought out Powelson, according to Leonard’s entry, “about eight years ago” which would make that about 1879 according to the author’s preface date of 1887. According to Leonard, prior to the Woodward Ave. address, the studio was located on Jefferson Ave. in Detroit, moving to Woodward Ave. “ten years ago” so about 1877. Leonard also described the studio as the oldest in the city at that time. Prior to the Woodward Ave. address, Detroit city directories show “Powelson & Co.” in 1870 at 5 Monroe Ave. and Campus Martius; B. F. Powelson at 223 Jefferson Ave. in 1875 and 219 Jefferson Ave. in 1892. The “& Co.” in 1870 for Powelson probably didn’t include Millard, as this census shows Scotland born photographer, Thomas Houghton, rooming with the Powelson family. Family and residence info on C. A. Millard: Charles A. Millard married Sarah Avery and they had two daughters, Lillian and Grace. Grace married Seymour H. Knox on June 11, 1890 in Detroit. (FamilySearch) Seymour Knox’s parents are listed on the marriage record as James H. Knox and Jane McBrier. According to the marriage record Grace was born in Connecticut about 1865 and Seymour was born in New York about 1861. The 1893 Detroit social directory, “The Blue Book” shows Mrs. Sarah Millard, Miss Lillian Millard and Mrs. R. S. Avery. The earlier 1883 Blue Book shows a residence address at 216 Bagg St. for Charles Millard, Mrs. Charles Millard, Miss Lillie Millard and Miss Grace Millard. (The ’83 also has an ad for “Millard. Photographer” showing up on page 6.) The 1880 Ionia, Michigan census shows Charles Millard, wife and daughters. Charles A. Millard shows up under his photographer heading in the Detroit City directories with residence addresses as: rooms at 101 Adams Ave. in 1880, residences of 479 Cass in 1881, 216 Bagg in 1883 and 104 Ledyard in 1884. It looks like the family’s longest residence in Detroit was the 104 Ledyard St. address, however Ionia, Michigan may have been the “home base” for Charles and his family. He was buried in Highland Park Cemetery, Ionia. 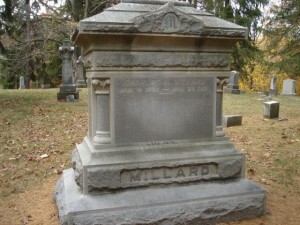 Sources: “Michigan, Deaths, 1867-1897,” index and images, FamilySearch (https://familysearch.org/pal:/MM9.1.1/N3VZ-86X : accessed 29 Jun 2013), Charles A. Millard, 25 Jan 1890. “Michigan, Deaths, 1867-1897,” index and images, FamilySearch (https://familysearch.org/pal:/MM9.1.1/N3V2-XYQ : accessed 29 Jun 2013), C.A. Millard, 25 Jan 1891. Photo: Findagrave (www.findagrave.com) Memorial #83481008. Photo taken by Richard Howell. Oval miniature photo on cardboard matting, circa 1880s – 1890s. 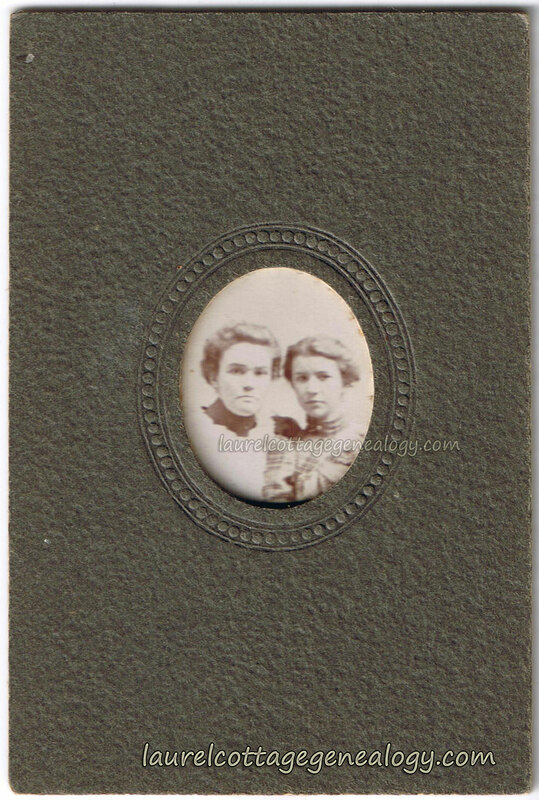 Another miniature photo found in Salinas, California (I think.) 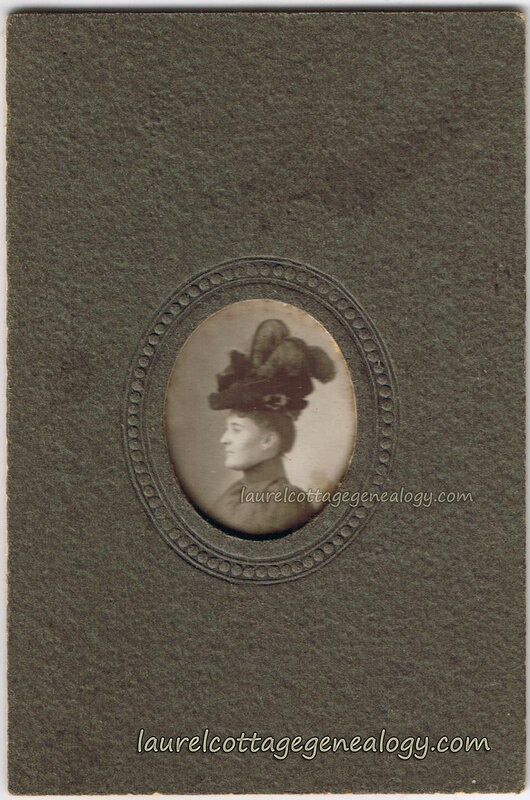 Woman in feathered hat, possibly ostrich. The size including the cardboard mat is 2 inches wide x 3 inches high. The photo itself measures about 2/3 of an inch wide x almost 1 inch tall. The original photo is clear, but impossible to get the clarity in the scan unless we were to remove the photo from the cardboard. It’s highly unlikely that a name was put on the back of the photo. Miniature oval photo on cardboard matting. Circa 1880s – 1890s. 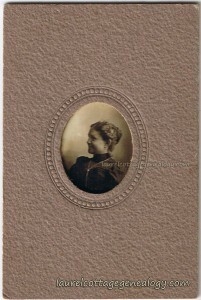 Miniature photo of unknown young woman, found in Salinas, California (I think.) The size including the cardboard mat is 2 inches wide x 3 inches high. The photo itself measures about 2/3 of an inch wide x almost 1 inch tall. This scanned image is a little dark and not as clear as the original, due to the fact that the matting is raised and the image is not laying on the glass when scanned. Oval miniature photo on cardboard matting, circa 1880s – 1900. Possibly mother and daughter, or sisters, friends, cousins? To me there is a family resemblance. Miniature photo found in Salinas, California (I think.) The size including the cardboard matting is 2 inches wide x 3 inches high. The photo itself measures about 2/3 of an inch wide x almost 1 inch tall. This scanned image is not as clear as the original, due to the fact that the mat is raised and the image is not laying on the glass when scanned. St. Mary’s in the Mountains Catholic Church is the oldest church in Nevada. 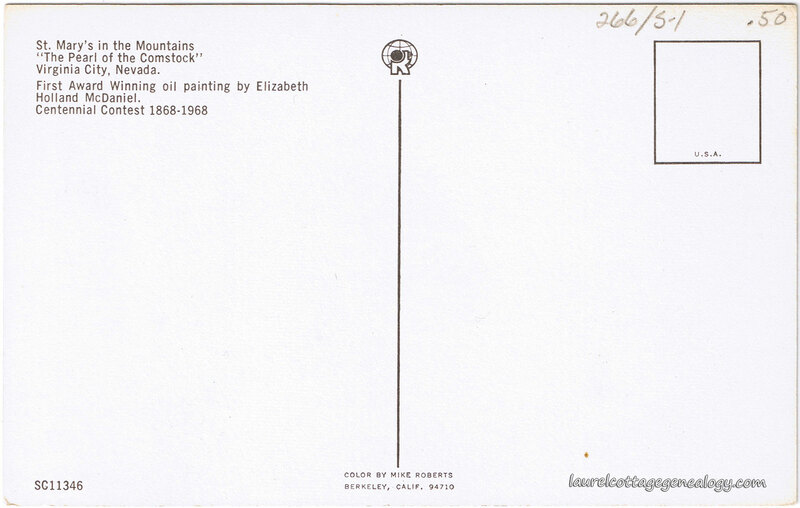 This postcard depicts Elizabeth Holland McDaniel’s beautiful oil painting entitled “Pearl of the Comstock.” At the time of this posting, I am not finding any duplicates of this postcard anywhere else online. There also doesn’t seem to be much available information on the artist, other than a description for her as “a mid-20th century artist.” The description on the back of this postcard could be interpreted several ways. Was the painting the artist’s first to win an award anywhere, or was the painting the first of the centennial celebration to be given an award, or did the artist win more than one award at the centennial but her first was for this painting? Since the celebration must have taken place in 1968, the painting might have been done in that year, or just guessing, maybe sometime in that decade, possibly 1960-1968. Divided back, unused postcard. Publisher: Pacific Novelty Co., San Francisco & Los Angeles. Series or number: S-632. 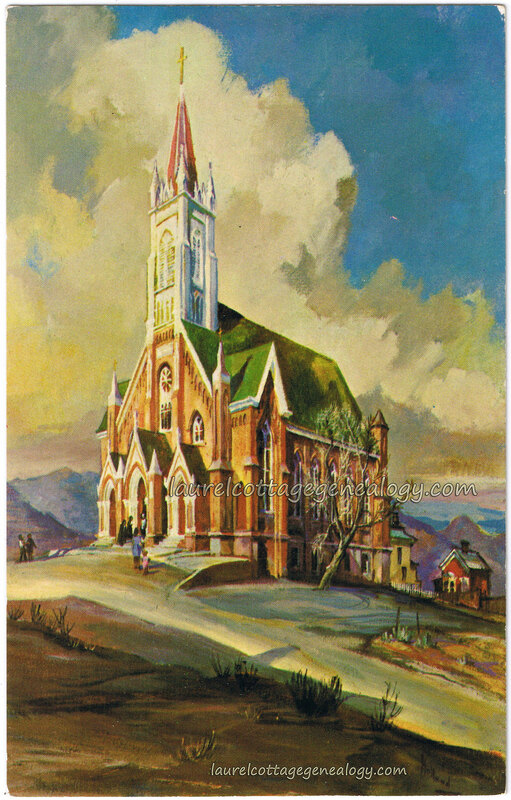 St. John’s of Monterey, (officially the Chapel of St. John the Evangelist) is part of the fascinating history of Monterey County, California. This Episcopalian chapel was originally built for guests staying at the very posh Hotel del Monte, part of the 20,000 acre resort complex built by railroad entrepreneur Charles Crocker, of “Big Four” fame. (Del Monte was an unincorporated community in Monterey County at that time, but later became part of Monterey.) Charles Crocker and C.P. Huntington (another of the “Big Four”) and others at the hotel were involved in the planning and construction of the chapel which started in the late 1880’s. 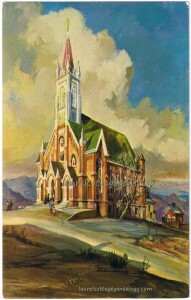 The chapel was dedicated on June 14, 1891, and consecrated in 1894. In 1957, because of the need to widen the nearby road, it was necessary to move the chapel across the highway to it’s present location on Mark Thomas Drive in Monterey. A present-day trip to view the chapel finds such friendly and welcoming people, and among other things, beautiful flower gardens, including the not-often-seen-in-these-parts Mock Orange, unusual small round stained glass windows, reminding this author of ship portals (like standing inside a beautiful old ship,) an old marble wall plaque dedicated to a Scottish-born world traveler, (very intriguing from our genealogy standpoint,) and a thrift store for the treasure hunter. Divided back, used postcard. Published by Summerskill, Prestatyn, Wales. Postmarked August 13th, circa 1904 – 1910. Advertisement for Chapman & Smith Co., Chicago, Illinois. Circa 1878 – 1890s. Candy crimpers, popcorn ball presses, Stone’s wax straws, julep strainers, cleaned currants from Greece, cleaned again by Chapman & Smith (the absolute cleanest – no dirt!) Turban cake molds, a Maricabo Coffee or Tea Urn (which contained a stone reservoir and lid to keep in the essence and flavor), Quaker bread pans, Boston Brown Bread flour and pans, Hick’s buttercup cutters, New England brand jam, Chapman and Smith jams and marmalade (blueberry, fig plum, pineapple…), all kinds of nuts (English, Grenoble and French walnuts, Canary almonds…), extra fine sugar jelly, New Orleans molasses, Acme (yes, Acme!) lemon squeezers, Jamaican and African ginger, Dutch caraway, etc. The address for Chapman & Smith from the 1899 catalog is given as: 185-187 W. Randolph St., Chicago, IL but they moved at some point in or before 1910, to 1017 W. Washington Blvd., Chicago, IL, since at the new address in 1910 they were granted the right by the Chicago City Council to construct and maintain a canopy over their sidewalk. This drawing was definitely of the 185-187 Randolph St. address, as you’ll notice the street numbers before and after their name on the front of the building. Sources: Internet Archive (archive.org) showing the full catalog text. Journal of the Proceedings of the City Council – Issue 1 – page 1644. Chicago 1910. Divided back postcard. Postmarked December 11, 1909 from New York, NY. Publisher: The H. Hagenmeister Co., New York. Printed in Germany. Number 315. The Williamsburg Bridge crosses the East River in New York City connecting the Lower East Side of Manhattan with the Williamsburg neighborhood of Brooklyn. At the time it opened in December of 1903, it was the longest suspension bridge in the world. “N.Y.C, Sat. Eve. Dec. 11 ’09. Dear Folks, 10 hr sketch a(?) esquisse – esquisse today. Subject a Facade of a Ferry(?) House. About 1/2 the ___ price(?) to design. Turned out the best sketch I have yet. Expected to go down town this eve – but it’s late and I’m tired. Will go to ___ library(?) and take a walk. Tomorrow will hear(?) Hillis I think, Trash, Lang, and I. Will send the original “pansif”(pensif?) of my ferry house right away. No mail today. ____ ____ Your(?) 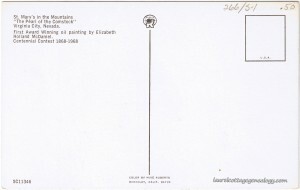 Harold” Card is addressed to Miss Lucile Umbenhauer, 932 Park St., Grinnell, Iowa. This postcard must have, at one time, been in the possession of the recipient’s daughter, Bettie Ogden, per the writing at the top of the back of the card. The 1925 Iowa census shows Lucile (Umbenhauer) Ogden, born about 1893, her husband Parke Ogden, her parents Daniel Umbenhauer and Luella (Way) Umbenhauer. The 1940 Federal Census record shows Lucile and Parke’s daughter Elizabeth Ogden, born about 1930, daughter Constance Ogden, born about 1926, and other family members. As to the sender, research indicates he is Harold Way, as Harold appears on the 1905 Iowa census residing at 932 Park St., Grinnell. Harold Way and and Luella (Way) Umbenhauer were siblings, so Harold addressed this card to his niece, who would have been about 16 years old at that time. From the content of the postcard, it sounds as if Harold may have been in architectural school…Further research shows Harold David Way, born 4 Oct 1883, occupation “Draughtsman,” employed by A.C.Bossom at 366 5th Ave. New York, and married, wife’s name Elizabeth, on the WWI Draft Registration Card. A.C.Bossom was London-born architect, Alfred C. Bossom (1881-1965.) The 1920 Federal Census taken in NYC confirms Harold’s occupation as architect, and shows him with his wife, their son Arnold, and a boarder, Ethel Daniels. Sources: Ancestry.com. Iowa, State Census Collection, 1836-1925 [database on-line]. Provo, UT, USA: Ancestry.com Operations Inc, 2007. 1940; Census Place: Cass, Jones, Iowa; Roll: T627_1172; Page: 3A; Enumeration District: 53-1. Source: Ancestry.com. 1940 United States Federal Census [database on-line]. Provo, UT, USA: Ancestry.com Operations, Inc., 2012. “United States, World War I Draft Registration Cards, 1917-1918,” index and images, FamilySearch (https://familysearch.org/pal:/MM9.1.1/K6J3-DXR : accessed 01 Jun 2013), Harold David Way, 1917-1918. Source Citation: Year: 1920; Census Place: Manhattan Assembly District 13, New York, New York; Roll: T625_1208; Page: 1B; Enumeration District: 941; Image: 617. Source: Ancestry.com. 1920 United States Federal Census [database on-line].